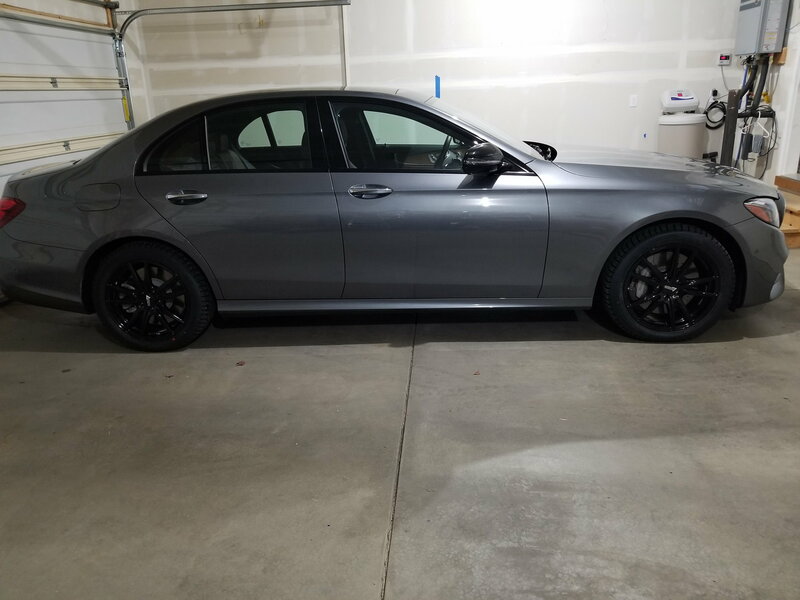 got my new winter shoes on yesterday with rims. 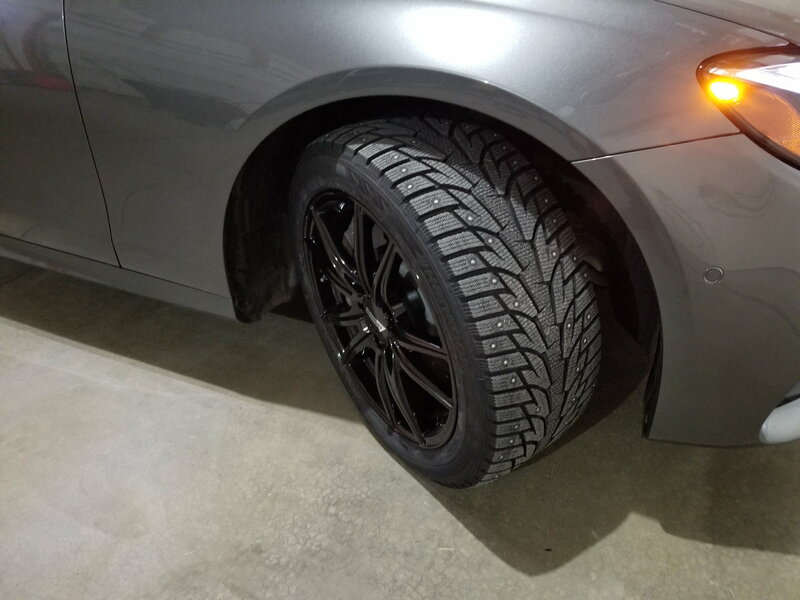 Very nice looking winter shoes. The black will never show all the crud that accumulates on the roads in the winter. I so don't miss winter!!! I have not seen studded tires in a long time. You must be in real snow country. We used to have them when we lived in Vermont.. Personally, I would have gotten stock wheels with studded snow tires. If you need studded than you have severe weather conditions. I would not subject those beautiful wheels to salt, grime, etc. that winter brings. But they do look nice - but darn they will be difficult to keep clean! Please tell me nobody would really wear something like that. Sad to say, but uh, er, um, yes, there are some who would wear socks with flip flops. While many parts of the US are bracing for the first major snow of the season, we're bracing for temperatures on Friday in the mid-60s. For High Temps. Brrrrrrrrrrrrrrrr. I may have to wear a long sleeve shirt. I'm sure I will be in your thoughts and prayers. They make shirts other than short sleeves? It's been 75° here. We have tough winters in San Diego. I don't own any long sleeved shirts or long pants. I got rid of that stuff when I retired 20 years ago. I rent cold weather duds if I need them for travel. LOL......The sacrifices we make to live in paradise! What do you do when we do have some cool weather, like tomorrow's projected temps in the 60s during the day and 40s tomorrow night? I love this. I remember living in Tampa many years ago and the dreaded 40s. I swear, I remember wearing sweaters and a jacket. In fact, when I moved to Boston for a year and saw people running around in 50F weather proclaiming indian summer, I thought that they were out of their MINDS. But now, when it's in the 40s in NYC, I put on an undershirt and wear a blazer. It's all perspective. Alas, today, in NYC, forecast is snow and it was 25 wind chill on the walk to the office. Ugh. They say our blood thins out down here. It's going to be 72 today and I wore a long sleeve shirt to work for the first time since last March. Sometimes its fun to go walk on the beach on a cold (by Florida standards) day. The snowbirds are in bathing suits and they even swim in the Gulf of Mexico, which no local would ever consider doing. We're the ones wearing hoodie sweatshirts or jackets. In the north, you know it's fall when the leaves change colors. In Florida, you know it's fall when the license plates change colors! I hope you don't get hit with too much snow and yes, there's a teeny tiny part of me that is jealous as snow can be so pretty when it's falling! Quote of the day! Kudos! The beach is usually 10° to 15° warmer than Tampa due to the Gulf. Seawater temperature today is about 78°F according to NOAA. I don't have a reason to go out at night except for special occasions. At my location the temps will be in the low 60°'s tonight and in the mid 50°s tomorrow night. I'll stay in with a steak and a glass of Maker's Mark (neat). Put out an extra glass and an extra steak on the grill! Oh, btw, nice tires OP. Yep 74 will be the high today in 92128 (San Diego inland) but 49 is the low, brrr. It's as I type it's 62 degrees outside, and going all the way to a high of 65. I'm loving every second of the cooler air, which is something we don't get much of in Tampa! lol... I am so glad I could start a post about the weather …..